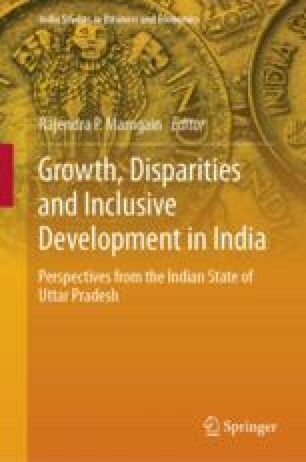 This article estimates the magnitude of public and private capital formation in agriculture in Uttar Pradesh with an aim to analyse its contribution in accelerating the rate of agricultural growth and the role of institutional credit in raising rural household’s investment. It begins with the temporal patterns in the public and private investments in agriculture and allied activities in the state as well as in India from 1981–82 to 2013–14. This is followed by a comprehensive evaluation of the investment behaviour of the borrower and non-borrower rural households during the NSS 70th round carried out in 2012–13. Broad findings reveal that both public and private capital formation in agriculture have scaled up to reach Rs. 18 billion and Rs. 47.2 billion respectively by 2013 at 2004–05 prices. However, the quantum of investment seems to be critically low in view of the existing low rate of agricultural growth and sizeable population dependent on it. Investment must increase by 2.76 times from 2015–16 level to achieve the targeted 5.1% rate of growth set by the government. While the required rate of increase in private investment (mainly by rural households) is estimated at 6.2% per annum, the same by the respective state government in agriculture as well as rural infrastructure would be 3.1% per annum. Private investment is majorly done through borrowings—52.8% from non-institutional sources and 47.2% from institutional sources with little disparity across the land size holdings. Farmers borrowing from the institutional sources tend to make relatively higher investments, which suggest improving the outreach of institutional agencies to the small land size holders across the poorer regions. The estimated elasticity of institutional credit with respect to private investment in agriculture is reasonably high at 0.26. The analysis suggests increasing institutional credit together with public investments in irrigation and rural infrastructure to facilitate higher rate of growth in agriculture in the state. A growing investment preference of rural households in non-farm business activities is identified for which a favourable credit policy should be in place.